You won’t find a wireless warehouse doorbell that is more reliable and easy to use than the LH-4000. Great for warehouses and businesses who need an extended range product. Amazing 4000-5000 foot range from transmitter (push button or door window contact) to the chime receiver. Never miss a customer or delivery again. The LH-4000 is the new, upgraded version of our best seller for businesses, the LH-2500. 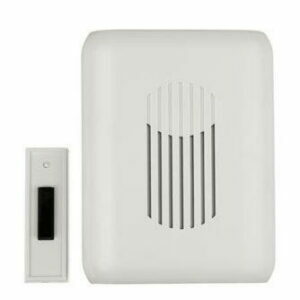 The LH-4000 is a wireless door chime kit that includes a wireless push button (or may be used as a door / window) contact and a plug in receiver. This kit is ideal for business–stores, shops, warehouses, etc., because the outstanding range (push button to the receiver) is significantly more powerful than other kits available. Than range of 5000 ft. + (line of site) means it can traverse a long distance, but can also penetrate environmental obstacles that limit other products. This is the ideal product to use a warehouse doorbell! Not only will this product give you the range and power you need for your shop or store, it is expandable by adding additional receivers and push buttons to the system. This means, for example, if you have a large warehouse, you can add chime receivers throughout your shop so you can better hear the chime sounds through the entire area. Simply mount the universal transmitter (UT-4000) to the exterior door as a push button or door / window magnetic contact, plug in the receiver, pair them together and you have an effective entry alert system for your business. Each receiver in this kit, the DCR-4000 plays 12 different melodies/sounds. This means that you can add 12 different transmitters with each playing a distinct sound so that you can distinguish what door or entrance was activated. In addition, add as many DCR-4000 receivers to the system as you want…this will enable you to add multiple receivers throughout your facility, ie., multiple offices and different locations. What if I have more than 1 door I want to monitor? The receivers can accommodate up to 12 different transmitters with each playing a distinct sound on the receiver. This means you can assign a different melody or tune to each door you want to monitor with a push button or a entry alert door contact. For example, you can put a push button on the front door and have the receiver play a simple “ding-dong” sound when a visitor pushes the push button. Next, you can add a door contact to a side door and have the receiver play the Westminster chime when that door is opened. How loud are the receivers? This business doorbell consists for two different components, the UT-4000 which is a universal transmitter you can use as a long range push button or a door / window contact, and a plugin receiver.